A valve in which fluid flows under falling pressure and increasing volume. a machine for cooling gas by expansion, with the output of external work. Expansion valves belong to the class of expansion machines but are used principally not to accomplish external work but rather to produce cold. The most efficient means of cooling a gas is its expansion in a valve. Expansion valves are used in units for the liquefaction of gas and the separation of gaseous mixtures by copious cooling, in cryogenic refrigerators, in units that simulate high-altitude and space conditions, and in certain airconditioning systems. Piston and turbine expansion valves (Figures 1 and 2, respectively) are the most widely used types. Piston valves are machines of positive-displacement periodic action in which the potential energy of the compressed gas is converted into external work by means of the expansion of individual batches of the gas, which displace the piston. They may be vertical or horizontal, single-row or multiple-row. Piston expansion valves are braked by an electric generator or, less frequently, by a compressor. They are used primarily in units having cooling cycles of high pressure (15-20 meganewtons per sq m [MN/m2], or 150-200 kilograms-force per sq cm [kgf/cm2]) and medium pressure (2-8 MN/m2, or 20-80 kgf/cm2) for gas volume flow rates (physical flow rates) of 0.2-20 m3/hr, depending on the temperature and pressure at the entrance to the machine. Turbine expansion valves are continuous-action blade machines in which the flow passes through fixed guide channels (nozzles), which convert part of the potential energy of the gas into kinetic energy, and through the system of rotating blade channels of the rotor, where the energy of the flow is converted into mechanical work, as a result of which the gas is cooled. 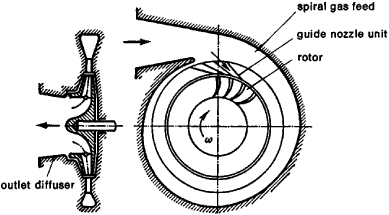 Depending on the direction of motion of the flow, turbine expansion valves are divided into centripetal, centrifugal, and axial types; depending on the degree of expansion of the gas in the nozzle, into active and reactive types; and depending on the number of stages of expansion, into single-stage and multiple-stage types. The reactive single-stage centripetal valve developed by P. L. Kapitsa is the most widely used type. Turbine expansion valves are braked by an electric generator, hydraulic brake, supercharger, or pump. They are used primarily in units having a low-pressure cooling cycle of 0.4-0.8 MN/m2 (4-8 kgf/cm2) for volume (physical) flow rates of gas of 40-4,000 m3/hr. Turbine expansion valves have been developed for low-, medium-, and high-pressure cooling cycles with gas volume flow rates of 1.5-40 m3/hr. They are characterized by small size (rotor diameter, 10-40 mm) and high rotor speed (100,000-500,000 rpm). In a refrigeration system, a valve for controlling the flow of refrigerant to the cooling element. The expansion valve in the ejector cycle is mainly used to adjust refrigerant flow to make sure there is positive SH (degree of super heating) at the exit of the upwind evaporator so no liquid refrigerant enters the compressor. 2001; Larsen and Thybo 2004; Qi and Deng 2008; Elliott and Rasmussen 2013), but note the difficulties caused by coupling, particularly between the expansion valve and compressor, as these both directly modulate the refrigerant flow rate. To understand the principles of thermostatic expansion valve operation, a review of its major components is necessary. The STS900 is a smart chiller that provides yacht owners, their captains and technicians with advanced technology - such as a variable frequency drive, programmable logic controllers and electronic expansion valves - to ensure optimal operation under any conditions. For configurations with both the original electronic valves and the integrated electronic expansion valve distributor's, a full series of SEER and HSPF tests were performed according to AHRI 210/240-2008 at various superheat settings for a system having a two-capacity compressor. An "electronic expansion valve system" means computers monitor temperatures at all times, making minor adjustments to keep everything at the right temperature while using as little energy as possible. Gas flow is precisely modulated by an electronic expansion valve to adjust the cooling capacity to the true needs of the utilities. It is strongly recommended that maintenance technicians measure and adjust superheat to the manufacturer's specifications for equipment with a fixed orifice metering device, or subcooling for equipment with a thermal expansion valve (TXV). The condenser is then connected through an expansion valve to the evaporator, which in turn is connected back to the adsorbers. The new parts includes 41 compressors, 48 condensers, 72 cabin air filters, 15 evaporators, one expansion valve, three pressure switches and 15 receiver driers. 2b, consists of: 1 -temperature and relative humidity controller of the air, inside the refrigeration room, 2a--air temperature display at evaporator outlet; 3a--air temperature display at condenser inlet; 4a--air temperature display at condenser outlet; 5a--display of sub cooled refrigerant temperature (at the expansion valve inlet); 6a--display of overheated refrigerant temperature (at the compressor suction line); 7a--controller of compressor suction pressure; 8a--controller of condensing pressure; 9a--display of air temperature inside the refrigeration chamber near the evaporator, 10a--display of air temperature inside refrigeration chamber near the door, 11--switch, 12--damage light indicator. By using an ejector that rapidly injects and expands high-pressure refrigerant, the energy that previously was lost in the expansion valve is converted to pressure energy and reused, thus boosting energy efficiency.